We’d love your help. Let us know what’s wrong with this preview of The Lost Cipher by Michael Oechsle. To ask other readers questions about The Lost Cipher, please sign up. The Lost Cipher was a little bit of a disappointment. With a name like The Lost Cipher, I expected this book to be all about a treasure hunt, but most of the book is about a boy named Lucas who goes to a summer camp for kids who have lost a parent. He meets other kids there including Alex and George who have also lost parents as well as a bully named Zach. Lucas, Alex, and George leave their hiking group and get lost. When Alex gets hurt, they have to find and accept help from a grizzly old moun The Lost Cipher was a little bit of a disappointment. 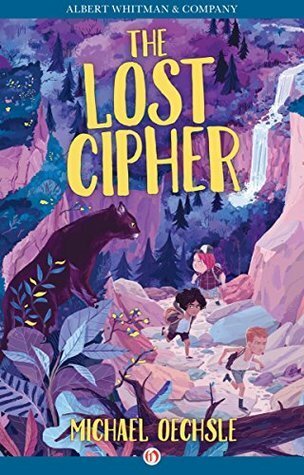 With a name like The Lost Cipher, I expected this book to be all about a treasure hunt, but most of the book is about a boy named Lucas who goes to a summer camp for kids who have lost a parent. He meets other kids there including Alex and George who have also lost parents as well as a bully named Zach. Lucas, Alex, and George leave their hiking group and get lost. When Alex gets hurt, they have to find and accept help from a grizzly old mountain man named Creech. At the very end of the story, the secret of the treasure is revealed, but it just seems like too much of a coincidence to be believable. I am very excited for local Hillsborough author Mike Oeschle. He set out to write a great middle grades book for boys and did just that. This book has everything for his target audience - lots of action, middle grades humor, local color and a true to life unsolved mystery. The language of the boys is so authentic that I would bet that Oeschle made recordings in his school art classes! I hope he is working on book two. I enjoyed this take on the mystery cipher. Three young boys go on an adventure to find it. But it also deals with loss and friendship in ways that are understandable and relatable. I thought the writing was excellent, and the plot moved along swiftly. I had no desire to try and skip pages when I was reading it, as I sometimes want to when reading middle grade novels. Oechsle took a cool idea and made it accessible to younger readers, but he also invites older readers as well, allowing us all to I enjoyed this take on the mystery cipher. Three young boys go on an adventure to find it. But it also deals with loss and friendship in ways that are understandable and relatable. Oechsle took a cool idea and made it accessible to younger readers, but he also invites older readers as well, allowing us all to enjoy this book and the mystery that it offers. Love the ending- stick with it. This book made me hang on the edge of my seat! What a great adventure story! This book will appeal to boys with its all male main characters, but I think girls who like action/adventure will enjoy it too. Very National Treasure!! This book starts out fairly interesting but it drags out too long before the actual “action” begins with the boys in the wilderness! I gave up halfway through the book. Lucas just lost his soldier dad to a battle overseas. His grandparents decide it would be good for him to go to Camp Kawani, a couple mountains over, for kids dealing with such a loss. Lucas doesn't feel like going, especially no that Gramps signed away their mountain to the mining company, but go he must. He quickly finds friendship with two other boys, Alex and George, mostly due to all of them being the brunts for the bullying of another kid, Zach. While on a hike, the kids watch the camp cou Lucas just lost his soldier dad to a battle overseas. His grandparents decide it would be good for him to go to Camp Kawani, a couple mountains over, for kids dealing with such a loss. Lucas doesn't feel like going, especially no that Gramps signed away their mountain to the mining company, but go he must. He quickly finds friendship with two other boys, Alex and George, mostly due to all of them being the brunts for the bullying of another kid, Zach. While on a hike, the kids watch the camp counsellors drive some treasure hunters off the camp lands. Later that night, the counsellors explain the legend of the treasure of Thomas Jefferson Beale, which is thought to be buried in the nearby hills. The counsellors make the kids promise to not go off treasure hunting, but when Lucas sees a cave on their overnight hike later he convinces Alex and George to quickly check it out. They're sure they can rejoin the others without problem, but they get lost. As they use Lucas' knowledge of the mountains to try and get them back to civilization, they run into a big clue about the real location of the treasure. I really don't know why Oechsle made the camp a place for kids who were grieving. I think he should've just made it a general summer camp. Grief is never addressed by the camp program, in fact, it seems that all the campers know why they're there but most refuse to talk about it. And that's just ridiculous. If you really had a camp for kids who'd lost a parent, there would be some kind of program to help them deal with the grief or there'd be no point to the camp. Anyway, the camp did a lousy job of doing what it was supposed to do, but it did provide a great backdrop for kids to get lost in the woods and go on a treasure hunt for a real legendary treasure. (Thomas Jefferson Beale's clues are historic and real. Whether his treasure is...that's up for debate. No one is really known to have cracked the first code or found any treasure.) Up until Lucas, Alex, and George get lost the book is full of boys playing camp pranks, not listening to adults well, and not dealing with emotions well. But once they are in survival mode the book gets fun. I was pleasantly surprised by the hermit character's development. And I found the finding of the treasure plausible. So in other words, I loved the treasure hunt parts of this and could do without the camp parts (or believe the camp parts could have been done much better if the camp did what it was supposed to do). Hand this one to kids who like plausible treasure hunts and codes (the Thomas Jefferson Beale codes are included the back of the book for kids who want a crack at 'em). The sentence structure within this book is very complex, which I appreciate, though I do wonder if it is too complex for the target audience. That being said the plot was deep enough and clever enough to keep me reading. I recommended this book to my nephew, who is 10, and so far he has been enjoying it. Though he said it is hard fro him to understand, especially the beginning. Lucas, grieving a father killed in combat, spends a week at a camp in the mountains. The other campers are also dealing with the loss of a parent, and some kids deal with the grief in more abusive ways than others. The core of the plot, however, is a treasure hunt for an enormous hoard of gold and silver that has been hidden since the early 19th century. This part is rooted in reality: the Beale Ciphers do exist, and only the description of the buried treasure has been decoded. The story itself Lucas, grieving a father killed in combat, spends a week at a camp in the mountains. The other campers are also dealing with the loss of a parent, and some kids deal with the grief in more abusive ways than others. The core of the plot, however, is a treasure hunt for an enormous hoard of gold and silver that has been hidden since the early 19th century. This part is rooted in reality: the Beale Ciphers do exist, and only the description of the buried treasure has been decoded. The story itself is satisfying, if not ground-breaking. Like many camp novels, this one has the awkwardness of meeting new cabin mates, hikes with inexperienced townies, and the requisite swimming hole. Like many treasure hunts, this one has kids solving the unsolvable, and a feast of riches tantalizing the protagonist. Unlike many stories about grief and loss, this one really doesn't go anywhere with such upheaving emotions. There's a nicely done scene as the three main boys fainlly talk about their parents, but the grief is otherwise not much more than a plot device to get all of the kids into the same camp. A glaring, wince-worthy problem in the book is the use of George ("the fat kid") as the perpetual comic relief. He has amazingly good self-esteem considering the amount of time he spends being ridiculed by others and even by himself--and there's not even a hint that the intense focus on his body has affected him negatively. What a relief it would have been to see his role move beyond fatness, candy bars, and the equation of obesity to grossness. All quibbles with the final point aside, the story is worth recommending to middle-grade readers who enjoy adventures and treasure hunts. Loved it! This book was written by my sons' art elementary teacher. It's about a young boy who loses his father and is invited to a camp in the Blue Ridge mountains for children who have lost a parent. Mr. O mixed in a little historical mystery about some buried treasure in the mountains that has never been found . . . Yet. The characters in this story were well developed and my boys thoroughly enjoyed the story as well as my husband and I. Definitely recommend it. Lucas lives with his grandparents. Not by choice, though he does love their place on the mountain. After his Dad dies in Afghanistan, Lucas only has his grandparents and the mountain. But his grandparents are struggling, and despite his Dad's final wish, they will sell the mountain. Now packed off to a camp for a week with other children like himself, Lucas sees little hope of seeing his mountain again. But then he hears about the buried treasure. Is it just a legend or could Lucas be the one to Lucas lives with his grandparents. Not by choice, though he does love their place on the mountain. After his Dad dies in Afghanistan, Lucas only has his grandparents and the mountain. But his grandparents are struggling, and despite his Dad's final wish, they will sell the mountain. Now packed off to a camp for a week with other children like himself, Lucas sees little hope of seeing his mountain again. But then he hears about the buried treasure. Is it just a legend or could Lucas be the one to finally crack the code and find the treasure? The Lost Cipher written by Michael Oechsle weaves legend, adventure, and loss together in a fantastic tale of treasure and friendship. Strong male characters will appeal to boys as well as the idea of lost treasure, codes, and mountainous adventures. A fun tale to read as summer approaches and children will be playing outside. Based on a true story of buried treasure, this book is sure to have children writing codes of their own and searching gold. Appropriate for children ages 9 and up. I struggled a lot with the beginning of the book. It got much more interesting in the middle. It seemed like much of the beginning and the parts with the bully at the camp were filler. They made sense in the plot, but weren't necessary. A terrific read! Adventure and parental loss combine to give this debut author a strong platform for a fine story. Set in the hard-scrabble life of Appalachia, the main protagonist, Lucas, has just lost his remaining parent to war and is sent (unwillingly) to a an outdoor camp for other children who have experienced similar loss. With two newfound friends, the trio fall into discovering the (real) legend of Thomas Jefferson Beale's Treasure. Overcoming a bullying fellow camper, an ancient hermit A terrific read! Adventure and parental loss combine to give this debut author a strong platform for a fine story. Set in the hard-scrabble life of Appalachia, the main protagonist, Lucas, has just lost his remaining parent to war and is sent (unwillingly) to a an outdoor camp for other children who have experienced similar loss. With two newfound friends, the trio fall into discovering the (real) legend of Thomas Jefferson Beale's Treasure. Overcoming a bullying fellow camper, an ancient hermit, mountain panthers, striking snakes and their own personal fears, the boys tenaciously (and foolishly) pursue the clues through the wilderness. Laughter abounds with the character, George, who grabbed my heart with his overweight, out of shape, devil may care, persona. Oechsle also gives the reader the tantalizing numerical clues and the end of the book to potentially find Beale's treasure that remains today still hidden...perhaps...in the mountains of Virginia. Read it in a single sitting and enjoyed it thoroughly! This is a great mystery and adventure story for middle grades to early teens. Lucas's father was killed in action in Afghanistan, and he lives with his grandparents on a mountain in a small town in WV where the family has long bed for generations. His grandmother sends him to Camp Kawani, a camp for kids who have lost a parent. He meets two boys who he begins to bind with. While there, they learn about the local legend of Thomas Jefferson Beale who supposedly buried a fortune in gold and silver. This is a great mystery and adventure story for middle grades to early teens. Lucas's father was killed in action in Afghanistan, and he lives with his grandparents on a mountain in a small town in WV where the family has long bed for generations. His grandmother sends him to Camp Kawani, a camp for kids who have lost a parent. He meets two boys who he begins to bind with. While there, they learn about the local legend of Thomas Jefferson Beale who supposedly buried a fortune in gold and silver. The location, treasure and families to whom the treasure belongs are in three ciphers. The second, the treasure, was uncoded using the Declaration of Independence. But the who and where aren't known. Lucas, eager to save his family's mountain home, convinces his new friends to search with him. This is a fun story but also touches on deeper elements of loss, grief and what truly is important. A quick read, but an enjoyable and engaging one. This was a nice read that I think would have some appeal to kids who were going through a difficult time. More so than focusing on the loss each of the kids had, it talked about the benefits of being the in the wilderness and the differences between the boys. They never really had any major breakdowns, but I think there were some emotionally poignant moments. The book got much faster for me once more information about the mystery of the hidden gold had a spot of predominance in the ploy. The boys This was a nice read that I think would have some appeal to kids who were going through a difficult time. More so than focusing on the loss each of the kids had, it talked about the benefits of being the in the wilderness and the differences between the boys. They never really had any major breakdowns, but I think there were some emotionally poignant moments. The book got much faster for me once more information about the mystery of the hidden gold had a spot of predominance in the ploy. The boys made some questionable decisions, but in the end it all worked out. I’d say this would be a solid read for middle-school boys. Warning: Contains some danger and talks about parents who were passed away. Who should read it? Middle-school boys and teachers/parents. I'm not sure others would be quite as interested. A great mystery book, set as an adventure, with feels through in for good measure. Lucas gets sent to a camp for kids that have lost a parent. So everyone has this deep grief, and some act out and some just swallow it in. Lucas, who is from West Virginia knows that he is looked down on because he is considered a hick or a hill billy. George is fat. Alex is hispanic. The fourth kid is rich and a stereotyped brat. And there is a treasure. A treasure that is a local legend, and more than anything, w A great mystery book, set as an adventure, with feels through in for good measure. And there is a treasure. A treasure that is a local legend, and more than anything, when Lucas hears about it, he wants to find it, so that he can save his mountain from strip mining. What happens makes for a great story, and is not quite how you think it will end. Very well done, great dialogue, very natural throughout. Kept me reading, when I should have been working. I wavered between 4 and 3 stars. Excellent book. The ending was a little too predictable, though, and that brought me down to 3. On the other hand, I don't know that much about this age group writing and may be expecting too much. Characterizations and dialect are quite good, and I enjoyed other kids starting to talk like him rather than the other way around. I say, write another one. This writer has potential. I thought this was a fun, fast paced read. The characters are interesting and likable. The situations are realistic and compelling. There are some interesting social issues (bullying, death of a parent, losses in war, development and displacement of poor people) that might connect with some kids. A gritty survival story that will appeal to fans of Hatchet. I felt that the main character, Lucas, was realistically rough around the edges, but his language and dialect might be too intense for some readers. At times the characters are one-dimensional, but the adventure angle keeps things exciting and will help pull in reluctant readers. Well-developed characters, I found the story itself pretty boring. The ending was great, but the parts leading up to it weren't as interesting. Overall, this story just didn't entertain me and I wasn't reading as much, so say this story is 2 stars. Loved this book! Real and lovable characters, adventure, and satisfying ending. Definitely recommend to Tweens and up. Great adventure about the Beale cipher - wished the language were less mature..